Like every food show fan, I’ve seen Gail Simmons on tv for years. But, I somehow never knew her career history until reading her first cookbook Bringing It Home: Favorite Recipes from a Life of Adventurous Eating of which I received a review copy. I was fascinated to learn that she was once Jeffrey Steingarten’s assistant, and her description of the research and ingredient gathering she did in that capacity sounds like a lot of fun. She also worked on Daniel Boulud’s PR team and then on Food and Wine magazine’s marketing team before becoming a judge on Top Chef. Her new book is about what she cooks at home and how her work experience, travels, and family have influenced her cooking. The dishes include breakfast, salads, soups, noodles, seafood, meat, party food, drinks, and sweets. I’ve marked the page for Chocolate Ginger Scones, made with coconut milk and coconut oil, that she makes for her dad who is now vegan. Also, the Beet Cured Salmon is something I’d love to try for the pretty pink edges on each sliced piece. I should point out that this is a book of real food. It’s not trendy food or food specific to any particular way of eating. Instead, it’s from-scratch, home cooking with lots of different influences and some great tips. One of those is to grill limes before juicing them for a vinaigrette. 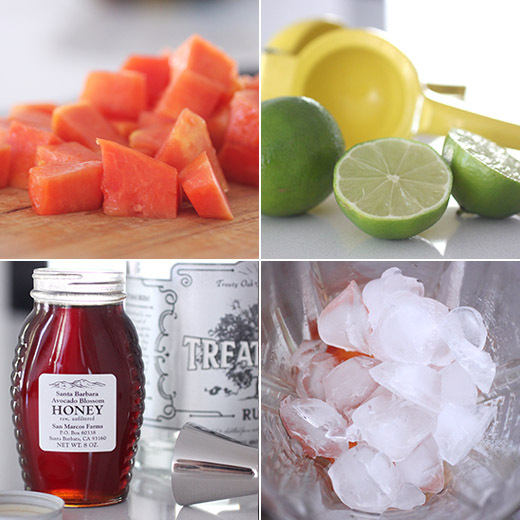 It will give you charred flavor and the warmed lime is easier to juice. The Singapore-Style Hokkien Noodles, inspired by a street-food dish enjoyed while shooting in Singapore, is adaptable with suggestions for changing out the meat used. I remembered from reading Cherry Bombe: The Cookbook that the recipe from Gail Simmons in that book was a cocktail. So, I was curious to see the recipes both alcoholic and non- in the drinks chapters here. The Cardamom-Walnut Date Shake sounds delicious, but I pulled out the blender when I read about the papaya cocktail. The cocktail was inspired by Nilou Motamed, the former editor of Food and Wine magazine, and in the book it's called The Nilou. In the head note, there’s a story about how papaya is a love-it or hate-it kind of fruit. This drink changed Gail’s mind about it. For me, my first encounter with papaya wasn’t a great one. I wasn’t sure I’d picked a good papaya since I though the flavor was lacking. I ended up using it in a tea bread like banana bread only with papaya. Since then, I’ve discovered I like the fruit much better with a generous squeeze of lime. 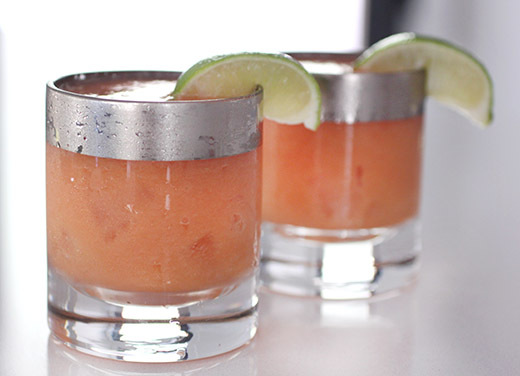 Here, chunks of papaya were blended with lime juice, rum, honey, and ice cubes. I was excited to use the avocado blossom honey I brought home from our summer trip to Santa Barbara. After pureeing in the blender, the mixture ended up thick, slushy, and a pretty coral color. Now, while it might seem fitting to serve tropical fruits for warm weather, summertime parties, I reach for them around the holidays. Maybe it’s because I love Mele Kalikimaka, but I think pineapples and papayas are perfect for Christmas. 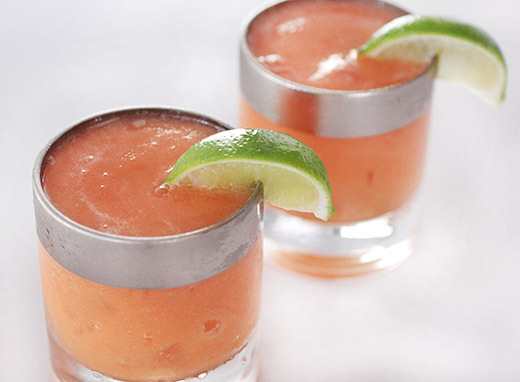 I’m already forming a plan for some tropical influence on our holiday menus, and these cocktails will be a welcome addition. I’m always on the lookout for vegetarian recipe inspiration, and Middle Eastern food is an excellent source. The latest book from Greg and Lucy Malouf is New Feast: Modern Middle Eastern Vegetarian , and I received a review copy. In the introduction, it’s explained that the climate and terrain of the Middle East is suited to growing a variety of vegetables and less so to raising animals for meat at a large scale. So, we easily find many vegetable, grain, and legume dishes with plenty of herbs and spices. As the authors set out to create this vegetarian cookbook, they wanted to excite people who are trying to eat more plant-based foods and offer some new ideas to those already on that path. The chapters include Breakfast, Breads, Butters and Preserves, Dips and Spreads, Pickles and Relishes, Soups, Stuffed Vegetables, Fritters, Savory Pastries, Raw Vegetable Salads, Cooked Vegetable Salads, Hot Vegetable Dishes, Grains, Rice, Legumes, Pasta and Couscous, Ices, Desserts, Sweet Pastries, and Cakes and Cookies. And, there’s a Menu Ideas list for how to group dishes for different occasions. One of my favorite menus is the Middle-of-the-week working lunch menu: Semolina Bread with Aniseed and Sesame; Artichoke and Lemon Labneh; Baked Tomatoes with Saffron, Bulgur, and Barberries; Shankleesh Salad with Parsley and Pomegranate; and Lemon Posset with Fennel Shortbread Thins. 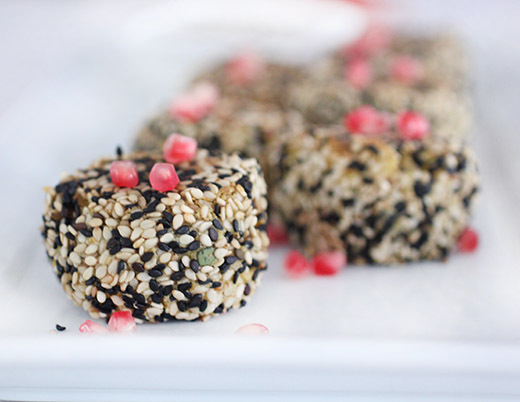 Some other recipes I’d like to try include the Middle Eastern Granola with Pomegratate, Sour Cherries, and Pistachios that’s made even prettier with dried rose petals and the Honey-Roasted Carrots with Dates Dandelions and Moroccan Dressing. But, I got completely distracted by the Breads chapter. The soft, pillowy-looking Sesame Joujou Breads were a strong contender, and then I saw the Griddled Flatbreads and all the suggested options for toppings. 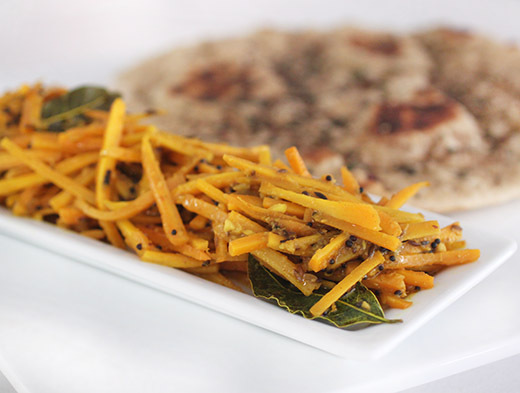 To go with the flatbreads, the Spicy Carrot Pickle looked like a fun pairing, and as warned in the head note, it is addictive. I started on the flatbread dough first since it needed to proof. Flour and baking powder were sifted before the yeast was added. Warm milk along with olive oil, yogurt, an egg, and salt were added next. Everything was combined in a stand mixer and then kneaded with the dough hook on low speed for several minutes to create a very smooth dough. It was placed in a bowl, covered, and left to rise for an hour. Meanwhile, I moved on to the carrot pickle. Carrots were cut into matchsticks and set aside. For a spice paste, cumin seeds and dried chiles were ground to a powder. Salt, minced garlic, and grated fresh ginger were added along with turmeric. In a saucepan, oil was heated and cumin and mustard seeds were fried until they popped. Curry leaves were called for, but I failed to procure them and left them out. The spice paste was added to the oil followed by apple juice and apple cider vinegar. The carrot matchsticks were stirred into the mixture. The heat was lowered to allow the carrots to barely simmer for about 15 minutes. Moving back to the flatbreads, the dough was divided into six pieces, and each piece was rolled just before cooking. The breads were cooked in a dry pan over high heat for a couple of minutes per side. After removing each bread from the pan, it was brushed with olive oil and sprinkled with herbs and spices. I used a mixture of sumac, za’atar, and fresh oregano on some breads and crushed fennel seeds and Aleppo pepper on others. The carrot pickle was nicely spicy. I tore off pieces of bread and spooned carrot matchsticks onto each bite. I kept thinking how delicious the carrot pickle would be on a sandwich. And, the breads bubbled just as they should while cooking and came out of the pan crisp on the edges and deliciously chewy in the middle. Eating vegetarian is an easy sell with flavors like these. Excerpted with permission from New Feast: Modern Middle Eastern Vegetarian by Greg and Lucy Malouf, published by Hardie Grant Books. 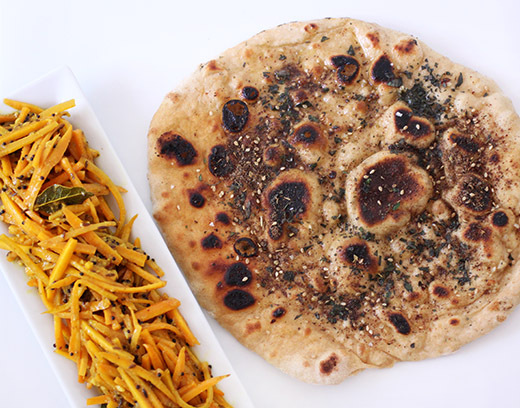 This is a wonderful all-purpose dough that suits both griddled and naan-style baked flatbreads, which are the most popular accompaniment for Middle Eastern meals. Use the basic recipe to make a batch of dough and fry them plain, or choose the filling that you fancy from below. The quantities of dough and fillings are sufficient for six large-ish flatbreads or eight smaller ones. Sift the flour and baking powder into the bowl of a stand-mixer. Add the salt to one side of the bowl and the yeast to the opposite side (salt can kill the yeast). Dissolve the sugar in the hand-hot milk then add it to the bowl, along with the oil, yoghurt and egg. Mix briefly to form a ball. Knead with the dough hook on a slow–medium speed for 10 minutes. You may need to scrape it up from the bottom of the bowl every now and then. Once the gluten has developed and the dough is smooth and satiny, shape it into a ball with lightly oiled hands and transfer to a large bowl. Cover with a tea towel and set aside in a draught-free spot for an hour, or until doubled in size. Punch down the dough and knead by hand for a few minutes. Divide into 6 or 8 equal balls. At this point you can fry the breads as they are, or fill them with one of the stuffings, as outlined below. Keeping the rest covered, roll out one ball of dough onto a floured work surface, to a 30 cm (12 in) round for large breads or 23 cm (9 in) for smaller ones. Heat a large, heavy-based frying pan over a very high heat. Fry the bread in the dry pan until large bubbles start to appear on the surface – it should only take 1–2 minutes. Flip over and fry for a further minute, or until lightly golden. Brush with clarified butter while still warm and serve. Repeat with the rest of the dough. This much-loved pickle seems to go with just about everything. We think you’ll find it’s addictive; we’ve been known to finish a jar in one sitting. Cut the carrots into roughly 6 cm (2 1/2 in) lengths, then cut into matchsticks. Set aside. 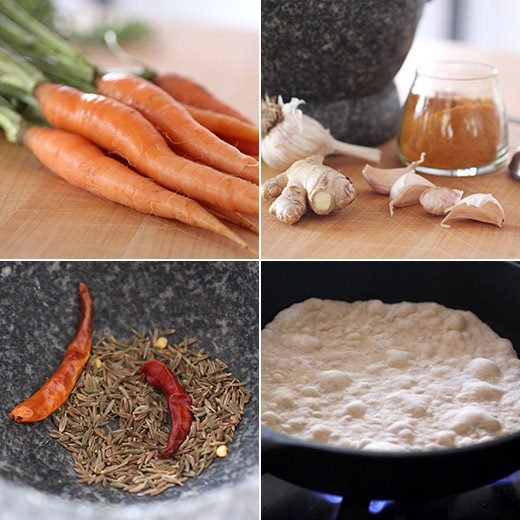 To make the spice paste, combine the cumin seeds and dried chillies in a mortar and grind to a fine powder. Add the salt, garlic and ginger to the mortar and continue to grind to a fairly smooth paste. Add the turmeric and sugar and mix in well. Heat the oil in a wide casserole pan – a cast iron Le Creuset is ideal. Add the cumin and mustard seeds and fry for 10 seconds or until they just start to pop. Add the curry leaves and fry for 1–2 minutes, until they turn translucent. Add the spice paste and cook, stirring, for 2 minutes. Add the apple juice and vinegar and bring to a vigorous simmer. Add the carrots and stir well, so that they are all coated with the spicy liquid. Lower the heat to a gentle simmer and cook for 15–20 minutes, stirring every few minutes to ensure they cook evenly. By the end of the cooking time the carrots should be soft, but still retain some texture and the liquid should have reduced by about one-third. Leave to cool slightly then transfer to sterilized jars and store for up to 3 months. Once opened, store in the fridge and use within 5 days. I love talking about good food. The details, minutia, and subtleties of what makes particular ingredients so good is the talk I enjoy. As we all know, when you start with the best ingredients, you’ll end up with the best meals. This is exactly the path taken in the recipes in David Tanis Market Cooking: Recipes and Revelations, Ingredient by Ingredient , and I received a review copy. Whether he’s writing about heirloom beans, the fleeting season for perfect tomatoes, or the “vast and remarkable difference between the taste of conventional factory chicken eggs and that of those purchased at a farmers’ market,” it’s the details about the ingredients that matter here. Once you’ve gathered the best you can find, the rest is easy. The recipes aren’t difficult, but they are all devoted to made-from-scratch cooking with instructions for homemade mayonnaise and yogurt to name two. In the recipe for Cucumbers in Yogurt, he explains that commercial Greek yogurt available today is too creamy and bland with a lack of acidity. By making your own, you can control the flavor by letting it ferment longer. The recipes are presented one starring ingredient at a time with varied flavor influences. Among the cauliflower dishes, there’s Seared Cauliflower with Anchovy, Lemon, and Capers and Indian Panfried Cauliflower. For winter squash, there’s Hubbard Squash with Parmesan and Brown Butter and Sake-Steamed Kabocha with Miso. I’ve made the Glazed Shitake Mushrooms with Bok Choy and Sesame, and it’s a nice mix of spicy and well-seasoned shitakes over simply steamed greens. My favorite part of the book is near the end with The Art of Seasoning. There’s a section about chiles that has inspired me to grab as many from our local farms as I can now that the season is at an end and roast and freeze them. I also have my eye on the recipe for Taqueria Pickles with carrots, jalapenos, onion, and garlic. Next time I have a bunch of fresh, lovely carrots, I’ll be deciding between North African Carrot Salad with Preserved Lemon and Roasted Coconut Carrots with cilantro and mint. 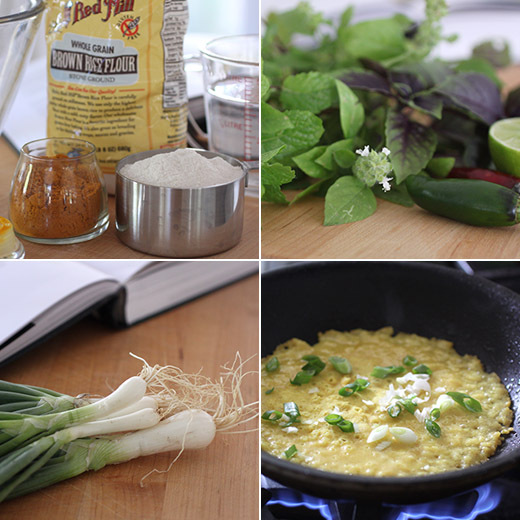 To start cooking, I flipped to the beginning for the Alliums United chapter. I had some green onions from the farmers’ market, and Golden Scallion Crepes sounded like a great way to use them. The crepes themselves are actually vegan with no eggs or dairy. The dipping sauce does contain fish sauce though. For the crepes, the batter was made with rice flour, and I used brown rice flour, ground turmeric, salt, and water. It was whisked together and left to sit for one hour. I cooked the crepes in coconut oil in a small skillet. The batter needs to be stirred well before ladling about one half cup into the hot pan. It does spatter a bit in the oil. The batter needs a couple of minutes to cook and set, and sliced scallions were added on top while cooking. Now, I had a little difficulty with flipping the crepes. They wanted to stick to the pan despite the oil. I loosened all around the edges with a spatula and carefully moved the spatula to the center of the crepe to completely loosen and flip. Still, a couple of crepes ended up broken. The dipping sauce was a mix of thinly sliced chiles, minced garlic, grated ginger, lime juice, a pinch of sugar, and fish sauce. 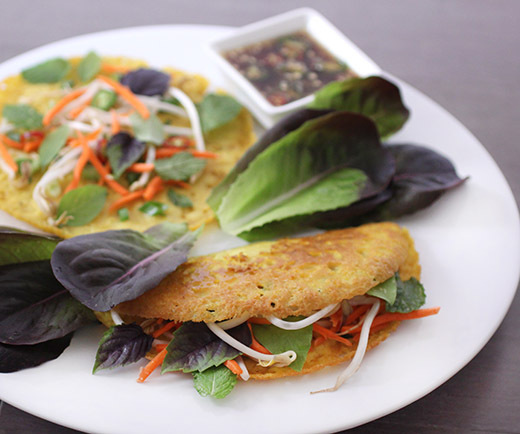 To serve, bean sprouts, grated carrots, mint, and basil were added before folding each crepe in half. Lettuce was served on the side for picking up the crepes. 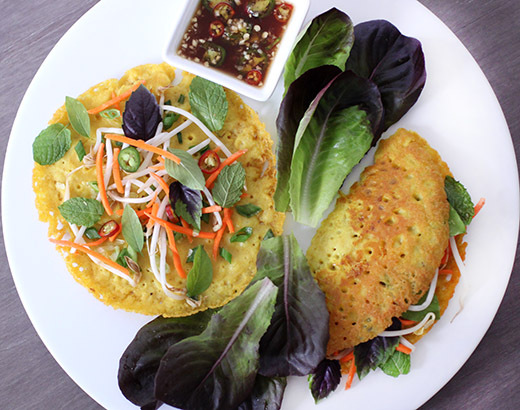 The crepes are a simple, tasty vehicle to convey all the fresh, bright flavors of vegetables and herbs and the zip of the dipping sauce. They become like a handheld salad with the lettuce used to wrap the crepes before dipping. I could go on and on about the flavors of the fresh chiles and just-snipped herbs, but there’s much better talk of good food and recipes to go with it in this book. When I receive acorn squash from my CSA, it takes me a few days to decide how to use them. My first inclination is always to roast and stuff the halves. But, a recipe in the September issue of Food and Wine gave me a delicious new idea that will work great for all types of winter squash. Baked squash falafel uses mashed, roasted squash in place of chickpeas, but chickpea flour is used to bind the mixture. The star ingredient here was the winter squash, and I get excited to use what’s fresh and in season from our local farms. But, for a recipe like this, it couldn’t have come together without a trip to the grocery store as well. Do you have strong feelings about grocery stores? I’m lucky to have great options for grocery shopping in Austin, and I’ve seen lots of changes to the grocery shopping scene here over the last couple of decades. What got me thinking about that is the new book Grocery: The Buying and Selling of Food in America by Michael Ruhlman of which I received a review copy. The book is a broad reflection on grocery shopping and how it has evolved from its beginning, but it’s also a look at what customers expect from grocery stores and how that changes with trends that come and go. I admit to feeling a little hometown pride in reading about the history of Whole Foods Market and how they were able to change the landscape of organic foods and what was available. They were able to buy enough from farmers for them to feel comfortable making the switch to organic, and they were able to convince beef suppliers to raise cows with no hormones or antibiotics. Because of asking for these kinds of products and having enough stores to sell high enough quantities, the market changed. Now, all grocery stores can carry organic versions of every type of food because more is being produced all across the country. My current wish is that this interest in organic supply would reach further into wine production. Another interesting, but unsettling to me, change in grocery shopping noted in the book is the rising demand for prepared foods. I find it sad to see this happen as more and more people place less priority on cooking for themselves. Ruhlman explains the details of how stores make these changes to what they offer and the challenges they face. As usual, his writing is full of insight and wit, and his personal experiences add to story being told. I might be one of the pickiest or most demanding grocery shoppers out there, but I do appreciate being able to find black and white sesame seeds along with chickpea flour, coconut oil, and almond milk yogurt, all preferably organic, all in one place. I definitely couldn’t have found all those things in one store if at all back when I first moved to Austin. To make these squash falafel, first the acorn squash was halved, cleaned of seeds, and roasted until tender. The flesh was scraped from the skins and mashed in a mixing bowl. Chickpea flour, chopped parsley and cilantro, minced garlic, ground cumin and cayenne, and lemon juice were added. 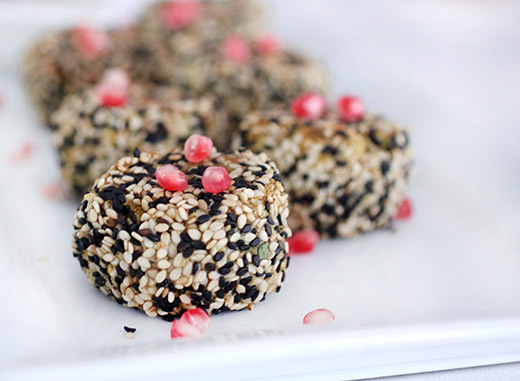 The mixture was shaped into little balls that were rolled in the black and white sesame seeds before being placed on a baking sheet with melted coconut oil. The balls were rolled in the oil on the sheet pan and were baked for 20 minutes. They were turned halfway through baking, and the turning flattened the shape a bit. Almond milk yogurt was mixed with chopped mint and a little more lemon juice. I liked that with almond milk yogurt, this was a vegan meal. 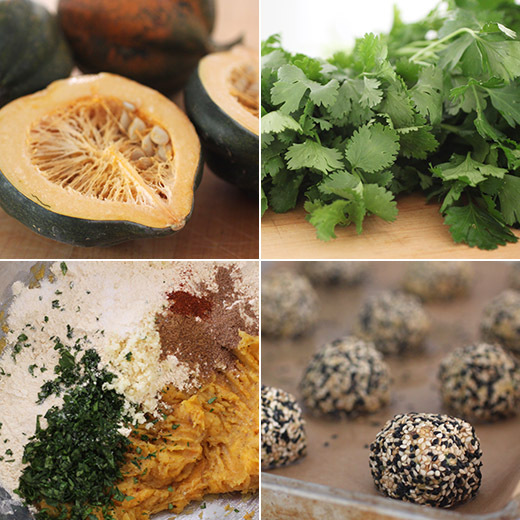 The herbs and spices flavored the mashed squash well, and the sesame seeds gave the falafel nice crunch. I garnished them with some pomegranate seeds that came from my own dwarf shrub. I love walking outside and harvesting edible things in my own yard and bringing home all the seasonal goodies from our area farms. But, I do hope our grocery stores continue to offer all the other stuff demanding shoppers like me want to cook with too.